JERUSALEM — Israel passed a controversial new “nation-state law” last week that’s sparking both celebration and fierce debate over the very nature of Israel itself. Each of these statements would be contentious on its own, but taken together, they’re a clear, unequivocal statement of how the Jewish state’s current leaders see both the country and the diverse people who call it home. Israeli Prime Minister Benjamin Netanyahu’s far-right government backed the legislation and was overjoyed at the law’s passing. Netanyahu lauded the law as “a defining moment in the history of the state” — a phrase that was splashed across the front pages of Israel Hayom, the country’s most-read newspaper, which is often described as Netanyahu’s Fox News for its favorable coverage of his government. But for Israeli Arabs, who make up one-fifth of Israel’s 9 million citizens, the new law was a slap in the face. When the law passed, Arab parliamentary members ripped up copies of the bill and shouted, “Apartheid,” on the floor of the Knesset (Israel’s parliament). But at the core of the new law is a deep, existential debate that Israelis have grappled with almost since the country’s founding: Can Israel be both a “Jewish state” that protects and celebrates Jewish identity, and a liberal democracy that protects the rights of all minorities, including non-Jews? Founded in 1948 in the wake of the Holocaust, Israel has long struggled with its self-identification as both a Western-style democracy that affords equal rights to all citizens regardless of race or religion and a country envisioned as a refuge for Jews. Waves of Jewish immigrants from Arab countries as well as from Russia and Eastern Europe, South America, and Ethiopia have kept Israel’s Jewish population growing. Under Israel’s law of return, any Jew can easily become an Israeli citizen. But during Israel’s war for independence, which Palestinians call the nakba, or catastrophe, 700,000 Palestinians were expelled or fled their homes. Today, their descendants remain refugees, and many still live in urban, slumlike refugee camps across the Middle East. Palestinians who remained in Israel in 1948 were offered citizenship and now make up 21 percent of the population. In the decades since its founding, Israel has fought several wars with its Arab neighbors, and battled Palestinian uprisings and terror attacks. Today, Arab Israelis have a different legal status from the 350,000 Palestinians who live under Israeli occupation in East Jerusalem, the 2.5 million who live in the Palestinian Authority-administered West Bank, and the 1.9 million who live in the blockaded Gaza Strip under the rule of Hamas, which the US and several other Western countries have designated a terrorist organization. Those populations of Palestinians are technically stateless. This means that, for instance, Palestinians in East Jerusalem can’t vote in Israeli national elections or obtain Israeli passports, among other restrictions. For Palestinians in the West Bank and Gaza, it means that major parts of their lives are controlled by Israel — a country they have no direct voice in. Arab Israelis, on the other hand, are citizens of Israel and therefore, at least in theory, have access to the same passports, elections, education, health care, infrastructure, and security as Jewish Israelis. But while they certainly enjoy more rights than Palestinians in East Jerusalem, who in turn have it better than Palestinians in the West Bank, who have it far better than Palestinians in Gaza, Arab Israelis say that since the state’s founding, in practice they have not been afforded the same rights as Jewish Israelis. This is one reason why many Arab Israelis refer to themselves as Palestinians with Israeli citizenship. The Association for Civil Rights in Israel, an Israeli human rights organization, has documented entrenched discrimination and socioeconomic differences in “land, urban planning, housing, infrastructure, economic development, and education.” More than half the poor families in Israel are Arab, and Arab municipalities are the poorest in Israel, according to ACRI. For Arab Israelis, then, the new nation-state law is merely the culmination of years of institutional discrimination. Only now the discrimination is officially enshrined in Israel’s basic law — the country’s constitutional equivalent. This declaration doesn’t just say that Israel is the historic homeland of Jews, which is a core part of Zionist ideology and the argument for the Jewish state’s existence in what’s now Israel. Instead, this goes further to unequivocally state that Jews — and only Jews — have the exclusive right to “self-determination” within Israel. In other words, only Jews have the right to determine what kind of state and society they live under. Which means that by default, non-Jews — such as Palestinian citizens of Israel, some of whom are Muslim and some of whom are Christian — don’t have that same right. Supporters of this declaration say that Jews have the right to a place of their own just like other people have, and that enshrining this principle in the law is necessary to ensure that Israel remains under Jewish control. Critics, on the other hand, say this measure is undemocratic and essentially enshrines two separate classes of citizens: Jews, and everyone else. Some even liken it to the strict racial segregation in South Africa under apartheid, in which the indigenous black African population was ruled by a colonial regime based on white supremacy. For 70 years, both Hebrew and Arabic were designated as official languages in Israel. This law just changed that. Arabic is widely spoken by Palestinians in Israel, as well as by some Jewish Israelis with roots in Arab countries. Yet the assumption in Israel has long been that you need to know Hebrew to get a good education and job, and to be able to interact with official government bureaucracies, which largely conduct business only in Hebrew. Arabic’s “special status” under the new law ensures that some things, like road signs, will remain in both languages. But Arab Israelis say that stripping Arabic of its official status is meant to erase their identities and histories. They also say it will put them at an economic disadvantage, because Hebrew is often not taught well in schools in Arab Israeli communities. 3) The law mandates that the “state views Jewish settlement as a national value and will labor to encourage and promote its establishment and development,” without specifying where. This clause, interestingly, has angered both the law’s supporters and its opponents. The former say it doesn’t go far enough because it doesn’t specify Jewish settlements in the West Bank. This is a fundamental issue for many religious and religious nationalist Israelis. They argue that the West Bank is part of Israel, both because Israel captured the land in 1967 and because it’s part of the biblical Holy Land. And since it belongs to Israel, the argument goes, Jewish Israelis are free to build settlements — small enclaves — in the West Bank. Most of the international community, as well as Palestinians and more than a few Israelis, disagree. They say that the West Bank belongs to a future Palestinian state, and that Israel has been illegally occupying it since it seized the territory in 1967. As such, Jewish settlements in the West Bank are illegal under international law. So by not specifically mentioning the West Bank, this provision in the new law walks a fine line, enshrining “Jewish settlement as a national value” without explicitly saying where those settlements might be. Even so, opponents of this measure say it’s damaging not just with respect to West Bank settlements but also for Arab Israelis, as the law appears to create a legal right to separate Arabs from living in Jewish communities. The nation-state bill passed on July 19 with a vote of 62 to 55, after years of political debate (the law was first proposed in 2011). In an age of hyperpopulism, where identity politics has made a resurgence as the liberal democracies of the post-World War II order face fundamental challenges from within, the nation-state law is a perfect power play for Netanyahu’s kind of nationalism — even if its actual application remains unclear. But it’s the sentiment, rather than the specifics, that’s attracted much of the public’s attention. Niran Dishin, a secular 24-year-old electrician and construction worker in southern Israel, told me he supports Netanyahu and the law, though he admitted that he didn’t really know the details of the legislation, as they didn’t directly impact him. Like most Jewish Israelis, Dishin served in the Israeli Army for his compulsory duty, which he said has shaped his outlook and disenchantment about peace talks with Arabs. He is “proudly” Mizrachi, a term used to describe Jews who came from Arab countries and who have historically been marginalized by the Ashkenazi, or Eastern European, founders of Israel. Today, Mizrachim are a core Netanyahu voting bloc. Dishin described Israel as both Jewish and democratic — but in his view of democracy, non-Jews, including Arab citizens, need to meet certain conditions to be given the same rights as him. One working day after the bill passed, members of the Druze community, a small religious and ethnic Arab minority within Israel, submitted a challenge to the law in Israel’s supreme court. And Ihab Elbedour, a 23-year-old Palestinian with Israeli citizenship originally from a Bedouin community in the south, fundamentally disagrees with the aims of the new law. Elbedour, a law student, said that non-Jewish citizens of Israel have long faced discrimination and this new law would make that inequality even harder to challenge. He speaks Arabic and Hebrew, and he learned the latter for school and work and from mixing with Israelis, who largely don’t speak Arabic. Adalah, a Palestinian-run legal center in Israel, is also planning to challenge the law. It’s using a broader human rights argument based on international laws against apartheid and Israeli legislation against racism and discrimination, said lawyer Sawsan Zaher. “The danger of this law,” Zaher told me, is that “it could limit our ability to challenge discrimination.” She added that while Palestinian citizens of Israel already face institutional discrimination, this new law makes it much harder to challenge. “It will be justified; it will even be encouraged to discriminate against Arabs,” Zaher said. Some supporters of Israel have dismissed criticism of the nation-state law as just another opportunity to bash the country while bigger abuses happen elsewhere. But others see it as an indication that the Jewish state, and the values it claims to represent, are fundamentally shifting. Netanyahu has aligned himself with illiberal leaders like Donald Trump and Vladimir Putin, and has even established relations with Saudi Arabia’s Crown Prince Mohammed Bin Salman. And just hours before the nation-state law was passed, Netanyahu met with Hungary’s far-right Prime Minister Viktor Orbán in Israel. The two have bonded over their shared loathing of anything connected to the liberal, Jewish, Hungarian-born financier George Soros, as well as their shared anti-refugee views. But Orbán and his government have also been accused of anti-Semitism over some of the language and images used in their attacks on Soros and Orbán’s praise of Hungarian Nazi collaborators. Netanyahu, though, has publicly painted a different picture of Orbán, calling him a “true friend of Israel” who has pledged to combat anti-Semitism and support Netanyahu’s brand of nationalism. Internally, Netanyahu’s government has also restricted the space for political criticism, such as promoting laws that make it harder to fund human rights groups and forbidding groups that criticize the military or occupation of Palestinian land from speaking in schools. In this context, the nation-state law has shone a light on the deep polarization in Israeli politics and society over the future direction of the country. This divide was perfectly captured in a pair of images. 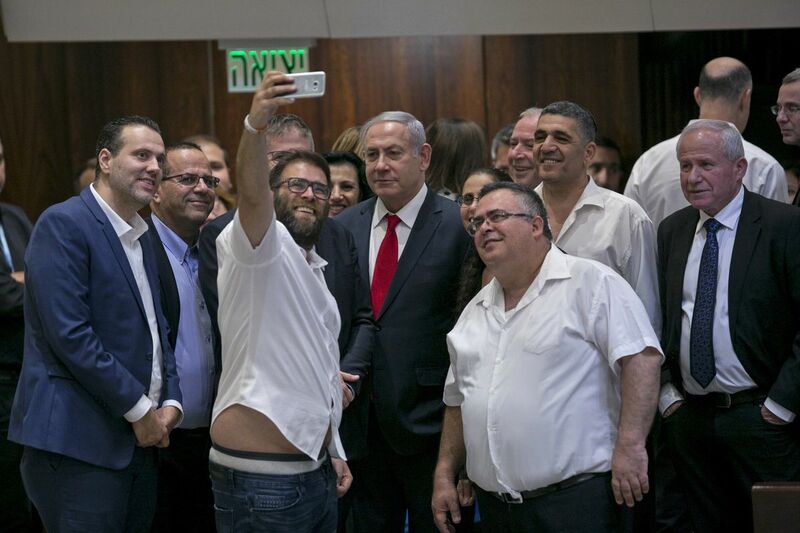 Knesset member Oren Hazan takes a selfie with Israel’s Prime Minister Benjamin Netanyahu, center, and MP David Bitan, right of Netanyahu, to celebrate the passing of the nation-state bill on July 19, 2018, in Jerusalem. Miriam Berger is a freelance journalist with a focus on people and politics in the Middle East. She is currently based out of Jerusalem.